well, Mass., has introduced a com- plete line of technologically ad- vanced radar systems designed to meet commercial and workboat operating standards. Koden developed one of the first color video sounders over a decade ago and is one of the most respected names in marine electronics. MD-3751, MD-3711B, and MD- 3721A. They are available with ranges from 32 to 96 nautical miles. All feature 12-inch, daylight bright green (or amber) screens and eight-level quantization to facilitate discrimination of targets from sea- clutter, rain and snow. Additionally, a microwave integrated circuit (MIC) is positioned in the front end of the receiver where it maintains high receiving sensitivity with low loss, to clearly display small tar- gets. The use of a long-life magnetron ensures high reliability of the trans- mitter and modulator. Mechanical parts, common to other systems, were replaced with reliable, solid- state devices. Other features include two EBLs, two VRMs, audible/visible proximi- ty alarm, interference rejection, tar- get enhancement and 50 percent downward off-center plotting. All are standard capabilities of each unit. Picture presentation modes in- clude head-up, north-up and course-up. The latter two modes are available when an optional interface unit is used to connect a gyrocom- pass. Standard equipment supplied with each unit includes display unit, antenna unit with cable, power ca- ble, spare parts kit and installation materials. Loran C units, the LR-771 and LR- 769, as well as two new color track display plotting units, the LTD-200 and LTD-100. Atlas rasterscan radars. Together with a 12-inch companion model, the Atlas 5600, well over 1,000 sys- tems have now been sold worldwide. A recently announced new 16-inch derivative, the Atlas 8630 VTC, has been specifically designed for port vessel traffic control applications and has already been ordered for service in China and elsewhere. Other products available include the NACOS 20 integrated naviga- tion bridge control system designed primarily for single manning and precision navigation at reduced cost. Typically comprising two ras- terscan radars, a doppler log, echo sounder and an adaptive radar-con- trolled autopilot, the main console also includes a full-color navigation information display unit as well as interfaces for other sensors and bridge equipment. COS 25, a three-radar configuration with a special navigation control center and identical workstations for the watch-officer, pilot and mas- ter. All radars additionally display lat/long coordinates together with own-ship position. Ship of the Future, research and conventional newbuilding applica- tions. Mackay Communications, Eliza- beth, N.J., a leader in service and communications for over 50 years, is now a premier marketing and sales organization. Shipowners, naval ar- chitects, government agencies, and shipyards can go to one source for all their equipment, consulting, ser- vice and installation needs. 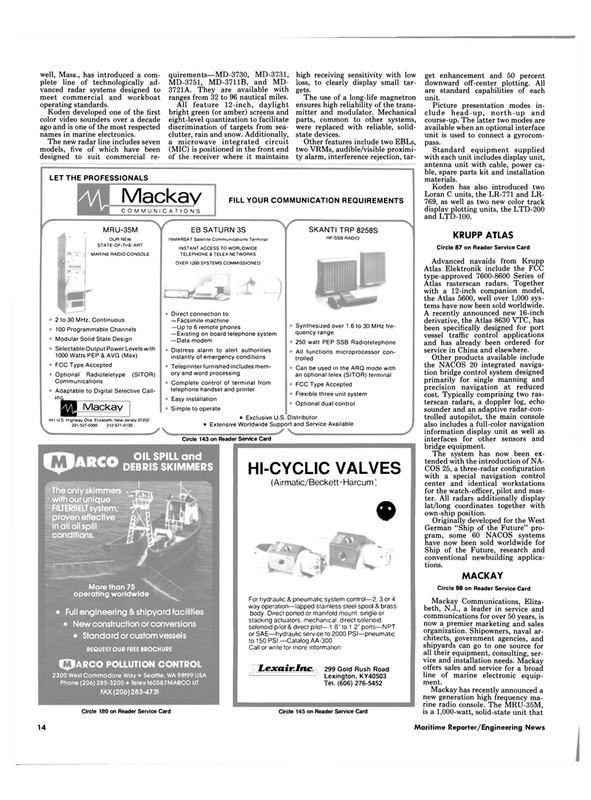 Mackay offers sales and service for a broad line of marine electronic equip- ment.